Community groups across Camden and Islington have been praised for an exhibition held at the Great Court in the British Museum. 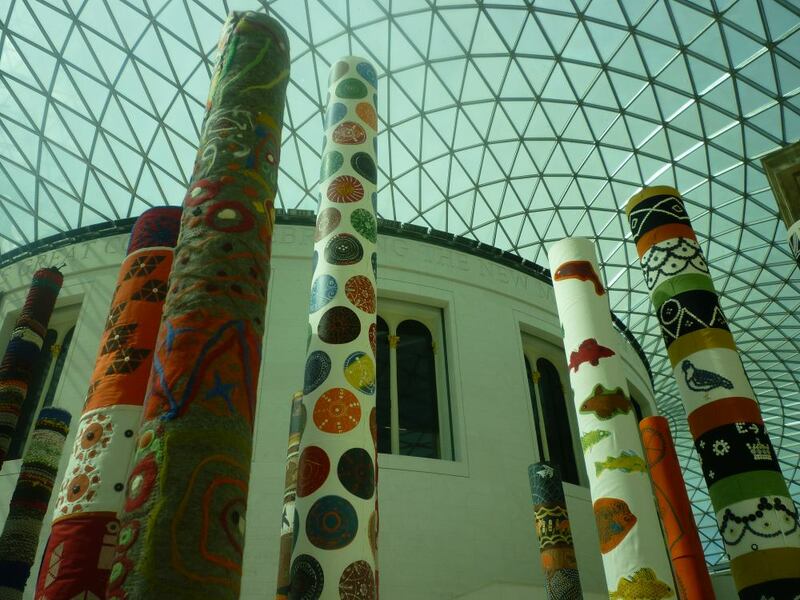 “The London walk”: Poles wrapped in textiles created by community groups in Camden and Islington on display in The Great Court. 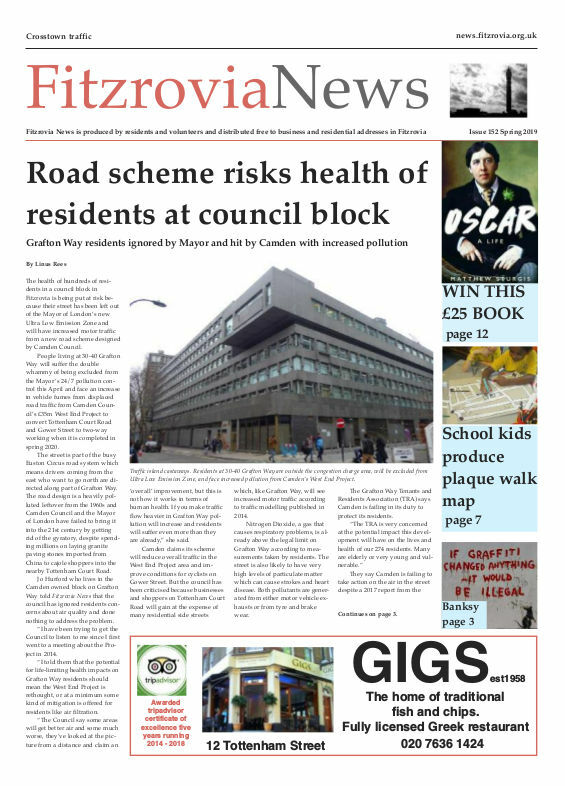 “The London walk” which was displayed from 17 April to 6 May was a project led by the Mary Ward Centre and included women working with the Fitzrovia Neighbourhood Association. The design for the project was inspired by Indigenous Australian artefacts and art work such as dot paintings, message sticks, painted memorial poles, woven baskets, and paintings of ancestor beings, such as the rainbow serpent. This was in response to a major exhibition at the British Museum presenting a history of Indigenous Australia. The community groups produced a playful scene of columns and designs, and takes its inspiration from the importance of landscape in Aboriginal paintings, and the design of the London tube map, with the river Thames weaving through the columns like a serpent. Pattern, colour and symbols are compared with those in London’s urban, social and architectural environment — glass panels of skyscrapers and the brickwork of historic buildings, and patterns found in the costumes of Pearly Kings and Queens. London wildlife such as foxes, rats, squirrels, pigeons and canal bird life are also included. “I thought it was wonderful. It ties in with the exhibition and captures visions of London belonging to some of the many communities who live here. I know that the brief I gave wasn’t easy, but by avoiding copying Aboriginal and Torres Strait Islander designs it actually achieves a deeper understanding of some of the concepts that underpin many Indigenous Australian art forms. Also, it looks absolutely stunning. The pole created by the Fitzrovia women will be returning to the Fitzrovia Neighbourhood Centre and will be on display in June as part of the Fitzrovia Festival 2015. The Mary Ward Centre led the project, working with several groups in Camden and Islington — Fitzrovia Neighbourhood Centre, British Museum community arts group, Chadswell Healthy Living Centre Bengali and Chinese groups, CSV/RSVP, HPod, Christopher Hatton Primary School, HAWA, Millman Street Resource Centre, Mildmay Street with Notting Hill Housing, Castlehaven Community Centre, Camden Chinese Community Centre, Single Homeless Project, and Women at the Well. Indigenous Australia: Enduring Civilisation continues at the British Museum until 2 August 2015.